I am a Master’s student from Sichuan University, China, majoring in Applied Linguistics. Last year, I was lucky enough to get an Erasmus Mundus scholarship. When I got a chance to choose a host university, I chose the University of Göttingen as my host university and MA Euroculture programme as my main course. Göttingen is such a spiritual spot, I realized, as it offered me enough time and energy to be able to reflect and refresh myself every day while I was there. My German friends and I held an inter-cultural discussion every Tuesday night in order to reflect on the inter-cultural communication we experienced every day in Göttingen, and also to discuss how to advance our spiritual perception by developing ourselves and serving the local community. People from different cultural backgrounds came and we enjoyed tea or coffee together, while sharing various ideas with each other. The Tuesday night discussion is still carried on by friends who are still in Göttingen. Every now and then, I join them sitting in front of my computer using Skype from Sichuan. I miss all my classmates, people from all over the world who were inspiring in their own ways. The most exciting experience among all, however, was the Euroculture Intensive Programme in Bilbao, despite the pressure from the work and presentations we had to prepare. Coming from China and having met many students from Asia in the Euroculture programme, I felt like Euroculture was collecting potential for the world by bridging the East and the West. I am truly grateful to have studied in this programme. It’s always true that it’s the people that make the place. What I miss most are, again, the people back in Göttingen. I visited lots of locals in Göttingen when I was there, and they offered me their best gift: friendship and love. Every time I went back to Göttingen after travelling to other European cities, I felt at home. Close to the city centre, you’ll find the Botanical Garden serving Persian tea. Best tea ever! My friends and I always went there for a nice chat or for a brunch. It’s another thing I fell in love with in Göttingen. It’s a small place, but you get everything you need around you and enough time to relax. I miss my German classes. The language classes the university offered were very helpful. I liked my German teachers and they really encouraged me to speak the language, even though I can barely continue a proper conversation for more than 10 minutes with a German person since I’ve come back to China. Göttingen is such a cute place in Europe especially because it holds many sweet people. It’s always peaceful, which allows you to slow down your life, to study and to work. I am extremely thankful that I spent a year in Göttingen and that I found so many good friends, not to mention my own self, through the whole journey. I am hoping to visit Göttingen again next year. Prayers and love to all my friends back in Göttingen until then. 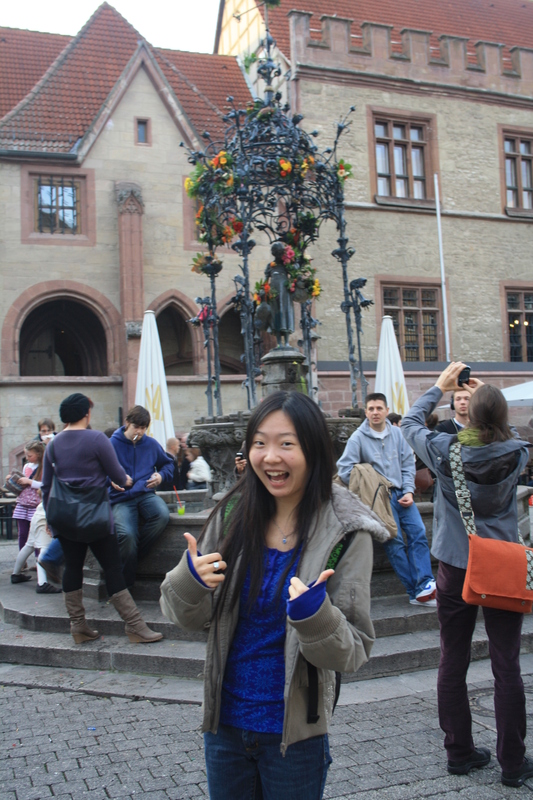 Lili is from Sichuan, China and holds a Bachelor degree in Applied Linguistics from Sichuan University. She is a guest student of the MA Euroculture Programme in the University of Göttingen and has studied in New York and at Uppsala University. Currently she is working on her Master’s thesis related to the Baha’i Faith and Chinese language in Sichuan University. She enjoys meeting people from different cultural backgrounds and believes “The earth is but one country and mankind its citizens”.